Looking for free masonry invoice templates? We've got you covered! Do I need more than just a masonry invoice template? Masonry is all about carving out beautiful products and tailoring them to the wants and needs of your clients. At ZipBooks, we believe that your billing process should be the same way, made just for you. 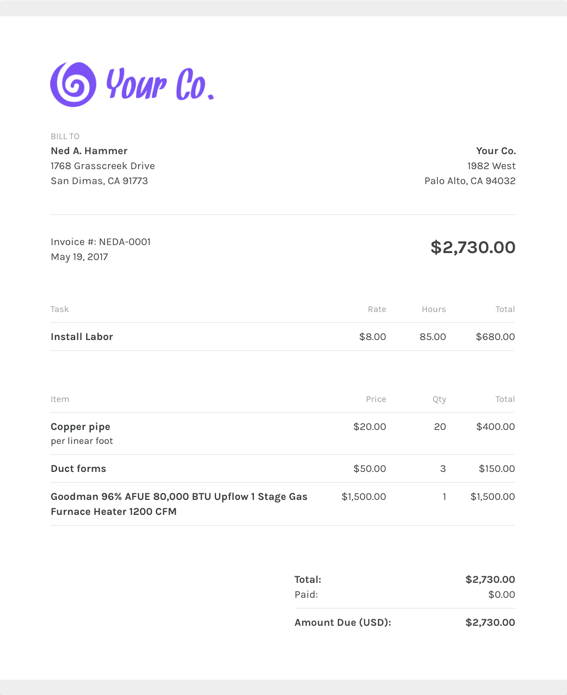 That's why we've created a free masonry invoice template, so you don't have to start from scratch, but you can also still customize it just for your business. You can even add your logo at the top! What should I include on my masonry invoice template? One of ZipBooks’ innovative highlights is that we will help you through every step of sending your first invoice. We use an invoice quality score based on real-time feedback to show you what to include in your invoice. Using ZipBooks for your masonry invoice template means never sending off an invoice without your own company information on it (oops!). We actually score your invoice based on what information you include so you’ll be able to get paid faster. Why should I use ZipBooks’ masonry invoice template to create and send my masonry invoice?